Motels are easier to sleep-in at than rest areas and Walmarts, so we got somewhat of a late start this morning. Our first stop was Dallas Theological Seminary. If I would have been a good evangelical dispensationalist, I would have attended here. I have long been familiar with this school and was anxious to see the campus. It is located very near downtown Dallas in what once was an upscale neighborhood but has now deteriorated. But the seminary determined to stay and built a huge student housing complex across the street. The campus was very nice; our favorite building was the bookstore, which was a tastefully converted small Greek Orthodox church, adjacent to the campus. Next, we headed for the Museum of Biblical Arts in North Dalllas, only to find that it had been detroyed by a fire recently ;( We debated about whether to do anything else in the Dallas area and thought it would be a good chance to see Fort Worth. We thought we would swing by the historic stockyard area and were immediately drawn to an extended visit. 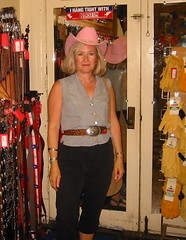 We enjoyed about four hours looking at the shops, eating Texan barbecue and watching the cattle drive. This was true Texas tourism and we ate it up. We remarked that we probably wouldn’t have stopped in Fort Worth had the museum been open. We were glad for the change in plans. Such are the advantages of ‘by the seat of the pants vacationing.’ We drove to Oklahoma City in the evening and checked into a motel. It was over 100 degrees today, and I don't think we could survive the night in the car. How did the cowboys do it? Nice gettup Esther! But what about the pointy boots??? And pink? What kinda cowgirl wears pink? O.k. - so you got that one down, now how about a picture with a set of 6-shooters on your hips! Yee-Haw! You go girl and keep that mild mannered library/museum buff in tow.